[June 2018 update: Good friends and the Both bandmates Ted Leo and Aimee Mann are playing a week apart in the New York City area this month. 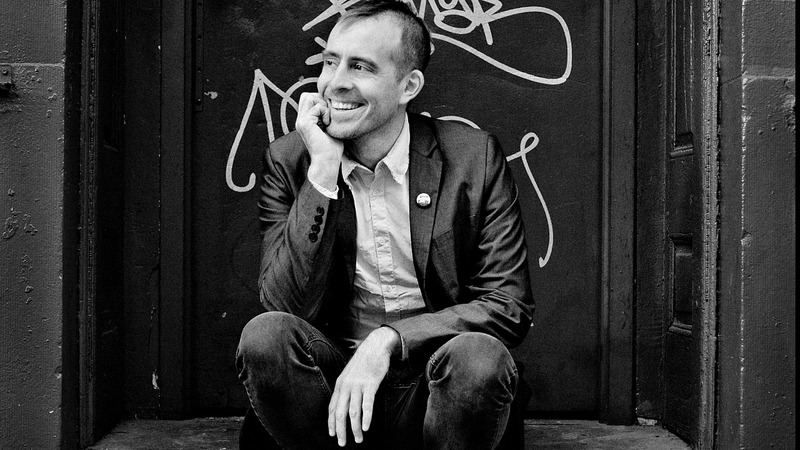 Ted Leo and the Pharmacists will be at Music Hall of Williamsburg on June 12 and June 13. The group's tour marks the 15th anniversary of its fifth album, 2003's Hearts of Oak, part of a tour that finds Leo dedicating two nights in six cities, one evening dedicated to that album and the other to Leo's greatest hits. The partnership of friends Aimee Mann and Ted Leo as The Both is one of the best things to ever come out of Twitter: the two pals maintained a long-distance connection over clever tweets (and hashtags) and eventually toured together, supporting their solo albums. At some point on the road, in the wilderness of Milwaukee, they decided to write songs together too. Their 2014 eponymous debut album, The Both, was the best of all worlds: Mann and Leo are smart, scrappy, and very funny together, nudging each other into new territories. Their songs, like "No Sir" and "You Can't Help Me Now" which they performed for FUV Live at Rockwood Music Hall a couple of years back, reflect their intuitive bond as collaborators. Leo, who is in the midst of a Kickstarter campaign for his next album, slated for an August or September 2017 release, told FUV that he and Mann are looking ahead to a second album together. "We 've already written some new stuff for the next Both record," he writes, "and as we wind down our solo touring schedules, our plan is to begin touring together again to finish writing and segue into another Both cycle." I didn't realize what a near impossible task WFUV had set for me until I sat down to actually try to come up with a list of five essential Aimee Mann songs. I mean, nobody said the five or the definitive five. But as it turns out, you could tell me which five to write about, and it would still send my mind careening around each album, making connections, and asking, "Yeah, but what about this one." I was certain, though, in my desire to go chronologically, to start with "Voices Carry." You have to remember what mainstream pop was like in the mid-Eighties to fully understand the impact of this song (and video) on a lot of us. Bad relationship songs were more about who cheated on who or who broke whose heart than exploring the devaluing of self-worth and manipulation of emotions by a domineering partner through a feminist lens—let alone from such a striking and singular voice as Aimee's in the 'Til Tuesday era. We send it up slightly when we play it live these days, but at its heart, it's a solid and moving song and I still get chills when I hear the crescendo of that original version. Arrrrgh. I have so many personal favorites on the first two solo albums, Whatever and I'm With Stupid, BUT YOU'RE ONLY GIVING ME FIVE, so I have to be ruthless and cut straight to "Save Me." It's an obvious choice for a reason: Aimee is in top form here, channeling the feelings of many of us who've felt like the self-described freaks in this song, and expressing what we couldn't about it with a precision and beauty that possibly only she could. Writing-wise, it's a timeless piece that has exactly the kind of bridge I love. It lifts the listener into the clouds for a minute, then slickly drops you back into a song that's been chugging along underneath you the whole time. Plus, she rhymes "perfect fit" with "tourniquet." Again, I want to add at least "It's Not," from Lost in Space, if not also "Red Vines" from Bachelor No. 2 in here, but I know where this list is going. I think it's important to include something from The Forgotten Arm, because that album is a concept album, and it really shows off her ability not just to sing about the things we're all feeling, but to tell stories that move us as well. To me, "Goodbye Caroline" is a central piece in this album that could almost stand alone in drawing you into the life of this down-on-his-luck, former addict, boxer and... well, no spoilers. It's also just one of many actually rocking songs that belie the notion that Aimee's entire ouevre is sad and quiet. I guess it's still kind of sad, but it's anything but quiet. I know, I know. See? You're saying, "What about 'Freeway'? What about 'Phoenix'? What about 'Labrador' or 'Gumby'?" I know. But there's a dark horse candidate for one of the absolute best here, in Charmer's "Slip and Roll." It's just a masterpiece of songwriting: lyrically, melodically, the harmonies, the pre-chorus that you think is already a great chorus until it hits that rising actual chorus of "take it, Take It, TAKE IT, TAKE IT..." and you're taken to a place you didn't even think this song was going. And as Aimee's voice has gotten a little deeper and fuller over the years, this is the song that really showcases how her already unique tone continues to grow in depth and beauty. Come on, you didn't think I was gonna NOT help promote my friend's new album did you? That's not the only reason for including this, though. This is an example of something I've learned in our years of working together: trust Aimee Mann. She knows what she's doing. We were together on tour when the particular photo of our mutual friends' cat, Goose, sparked the idea for this. At first, I wondered if the title phrase was too obtuse (or too specific) for what was shaping up to be a heartbreakingly beautiful song that would surely rank among the greats in her canon. But she did it—she just sang the words, and it brought you into her mind, into the world of the song, into the melancholy and love, and you were on board, even if you didn't know about the cat named Goose. I mean, I'm speaking for you here, but I'm gonna wager I'm speaking true. So yeah, trust Aimee Mann. Read all of FUV's Essential Albums and Songs here.